Do not put minnows in an aquarium with large fish as they may be eaten. Do not keep any solitary minnows. Check your local bait shop if you are having trouble finding minnows. While many people use minnows simply for bait, others enjoy the idea of having an aquarium full of small fish. Minnows are also extremely easy to maintain. Using a few simple steps, you can have a brand new minnow habitat up and running in no time. Make sure that the aquarium you are using is clean. If you have had previous fish in the aquarium that have died, it is imperative that you scrub out the aquarium and rinse it vigorously to ensure the most healthy environment for your minnows. Place the 10 gallon aquarium in its permanent location. Make sure that you are placing the aquarium some place you want to keep it for a while, because it will be much more difficult to move after filling it with water. Place the under gravel filter into the tank and then fill it with gravel. While doing this, lay the clay flower pot (or slate cave) onto the bottom of the aquarium and put gravel around it. It is best to fill the gravel at least an inch high in the aquarium to ensure the clay pot stays in place. The pot will ensure a proper egg laying site for any impregnated minnows. Add water to the aquarium. While doing this you can add the aquatic plants into the aquarium as well. Adding some of the plants near the clay pot is ideal. Continue filling until the aquarium is nearly full. Make sure your plants, if using them, are suited for the fresh water conditions. Add the minnows to the aquarium. 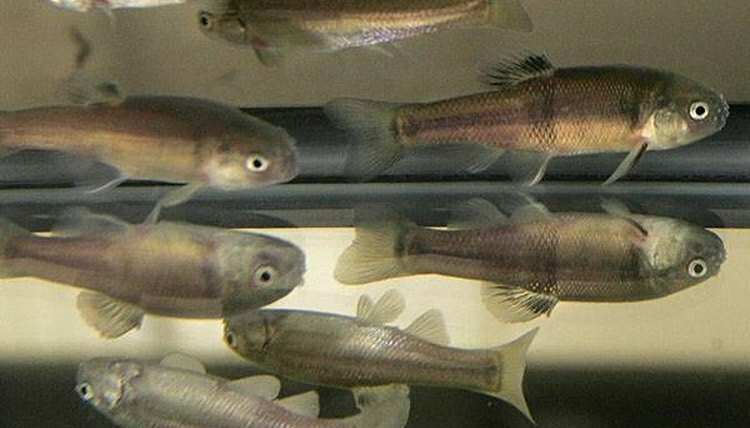 Minnows will usually get along with other smaller fish, but larger fish may eat them. Place the aquarium light on top of the aquarium. No water thermometer is necessary as minnows can survive a large range of temperatures. An ideal temperature, however, is between 70 F and 75 F.
Make sure to care for your minnows. These fish prefer long summer days, so leaving the aquarium light on for 15 hours a day is preferable. Make sure to feed the minnows daily. Foods such as flakes, insects and mosquito larvae are preferable. Make sure to get a larger tank if the minnows start to multiply. Only around six fish should be kept in a 10 gallon tank. Keep up basic maintenance of the tank. The gravel should be cleaned every so often, and using a gravel vacuum makes this easy. Now enjoy the thrill of having your own minnow aquarium.